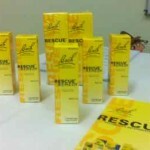 On this coming Friday, 27 July 2012, I will be talking about using Rescue Remedy and Rescue Cream to deal with emergencies and our daily stress at my friend’s newly started Holistic Centre in JB, Malaysia. 地点：綠康中心 150A，Jalan Dedap 13, Taman Johor Jaya. Thanks to Grony Garden for organizing this talk. Great place, great audience. More talks coming soon.